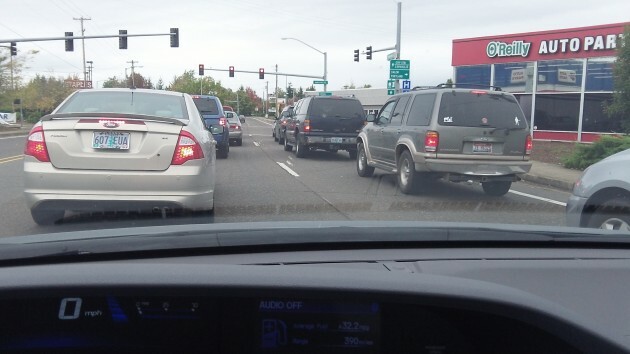 Traffic on Albany’s Santiam Highway. Sooner or later we’ll need the tx per mile. The Oregon Department of Transportation is working to launch a road-user tax that charges for the miles vehicles are driven on public roads within the state. The program won’t begin until next July 1, it is not allowed to involve more than 5,000 vehicle owners, those 5,000 must be volunteers, and yet a backlash is already beginning to grow. But we won’t be able to avoid a mileage tax as technology marches on. The 2013 legislature authorized this after 12 years or studies and pilot programs. ODOT will allow volunteers accepted by the department to pay a tax of 1.5 cents a mile instead of the 30-cents-per-gallon state fuel tax. Their vehicles must be equipped with technology that reports the distance driven, and at least one of the available technologies for volunteers to choose must not be based on GPS tracking. The owners will be billed for the miles the vehicles are driven, and they get a refund of the 30-cent-a-gallon state gas tax. Eventually, depending on further legislative action, Oregon will probably expand the program and make it mandatory for high-mileage vehicles. Oregon is first with this approach, just as it was the first a century ago to collect a gas tax to pay for highways. Republican state Sen. Doug Whitsett of Klamath Falls, a normally sensible fellow, is among the opponents. In a newsletter he complains that the tax “discriminates against high-mileage vehicles.” Actually, for now, it does not affect anyone who does not volunteer to take part. So what’s the problem? And in the long run, though, it’s high-mileage cars that make the tax necessary in the first place. Whitsett also complains that it “discriminates against families who live in rural areas” because they must drive greater distances than people in cities. Of course, but they already pay more road tax than city dwellers because they have to buy more gas. And if they drive older vehicles that get less than 20 miles to the gallon, they would be better off with the flat 1.5 cents a mile. Oregon is pioneering the road-user tax because sooner or later we, and the whole country, will have to either replace or supplement the gas tax with another form of user tax. That’s because cars and pickups keep getting better mileage. When gas was cheap and we all rolled around in land yachts getting 12 miles to the gallon, the gas tax was a steady source of support for building, maintaining and expanding our bridges and highways. Improved mileage now means less revenue per vehicle. Moreover, we have to find a way to assess a fair road tax against owners of vehicles that use no gas at all. Earlier this month, on a lonely but recently resurfaced stretch of Interstate 5, I was trying to keep up with a Tesla, an expensive luxury ride. While I was paying about 70 cents per gallon in Califiornia and federal taxes for gas — at the rate of about 2.2 cents per mile — the guy pulling away in the all-electric Tesla at 90 mph was using the road for free. When this proposal surfaced awhile back, I volunteered via email. However, I was not to be considered because my old Saabs don’t have (and cannot be retrofitted with) the current technology to run the program. That has the potential to be yet another “glitch” in the system — how do you “count” older-vintage vehicles? I’m not sold on the “mileage tax”. ODOT claims they need the tax to maintain road surfaces. Well, the need to maintain road surface is a function of vehicle weight as measured at the axles. Cars don’t matter much when it comes to road wear. Road damage is effectively caused by trucks. And the heavy trucks already pay the Heavy Vehicle Use Tax. Should trucks pay more? If “fairness” is one of ODOT’s objectives, then they should create a tax on a sliding scale that factors in both miles traveled and vehicle weight. If they don’t, this “mileage tax” essentially becomes just another government grab for money and unintended consequences are certain to result. And for those from out of state that use our roads? So, since in theory a mileage tax is to keep things fair and part of the reasoning is that currently people with hybrids or totally electric vehicles don’t pay their “fair share”, a device like this would level the playing field so everybody pays as they go. Wow, did I get enough buzz words and cliches in that sentence? So if the state shifts to a pay as you go system I would hope they come up with a model for bicycles. After all governments for decades have been promoting higher and higher milage requirements and even mandating percentages of total sales that must be electric/hybrids to cut fuel usage. Apparently they couldn’t do the math and see what it would do for the resulting road tax shortages. But then why should they. It’s other people’s money after all. I don’t have a problem with some program being implemented for “plug in” type vehichles. For other vehicles, the current program works fine. Heavier vehicles use more gasoline, but also cause more wear & tear on the highways. IF they was only a way to tax the damage studded tires do. Maybe a Federal (to prevent buying your studded tires just over the state line to avoid a state studded tire tax) Tax with the money refunded to those areas where the tires are purchased. That would be an incentive for people to not use them until winter weather actually is occurring. Well, at least the government would no longer have a motive to reduce our fuel mileage with the idiotic ethanol boondoggle. Now, they want to cut the mileage we get so we have to buy more fuel; thus the ethanol mandate. Who knows, the Democrats might even eliminate that costly mandate they dreamed up if we go with a mileage tax (especially if it raises more revenue for them to spend). Hasso, excellent article. I think it is prudent that state and federal governments look at alternative methods of funding road construction and maintenance cost as technologies advance.